Panasonic at CES 2018: 5 key highlights, including OLED TVs and Technics turntables | What Hi-Fi? And to help the brand do that are new 4K OLED panels, processors and technologies for its 2018 OLED line-up, as well as four new Ultra HD Blu-ray players and vast HDR10+ support. That may sound more like evolution than revolution, but the Japanese giant's efforts to move audio and visual performance forward in a way that's actually tangible right now is welcome at a show full of concepts and prototypes. Elsewhere, Technics has unveiled the specs for its “most premium turntable ever”, and Panasonic is doing everything but hand out party poppers in order to tell the world that it's turning 100 this year. Sure enough, Panasonic is continuing its confident strut on the OLED stage this year. Its 2018 TV ranges, the Z950 and Z800, which come in 55in and 65in versions and simply have a soundbar to separate them, feature new (still LG-sourced) OLED panels. But Panasonic’s next-gen HCX processor is the prime mover behind the performance advancements Panasonic claims to have made. From our first impressions, it’s enabled picture improvements in daylight scenes, thanks to the introduction of ‘Dynamic LUT’ (or ‘Dynamic Look-up Table’) technology, and has allowed users more control to tweak luminance levels at the darker end of the scale for better performance in low-lit scenes. Combine that new-and-improved panel and processing with support for HDR10+ (of which Panasonic is a co-founder) and you have a telly that, in the words of Panasonic, can bring Hollywood to your home. It looks like HDR10+ will feature across a fair share of the 2018 4K TV range, too. We witnessed a preview demo of the HDR format on one of Panasonic’s yet-to-be-announced 2018 LCD TVs, and compared to standard HDR10 the difference proved quite noticeable. The scenes of beaches, hills and flowers took on greater dimension, with contrast and colour-shading notably enhanced. How it’ll compare to Dolby Vision (a rival dynamic metadata HDR) remains to be seen, but for now we'll file it under "promising". Then there’s the TVs’ new True Cinema mode, which, perhaps most applicable to the company's Hollywood-centric tagline, has been created by colourists working in Hollywood. While Panasonic’s upcoming TVs will opt for HDR10+ over Dolby Vision, the brand’s 2018 flagship player will support both. Why? Because Panasonic shifts more players than TVs, and it wants to offer universal appeal for people without a Panasonic TV (i.e. it wants to sell more players). HDR10+ is now available on Amazon Prime Video (for select TVs, anyway) so we can only hope support will follow on Blu-ray discs soon. For Technics, 2018 doesn’t just mean getting the credit for the Dynamic Blade soundbar-style speaker it tuned for the upcoming Z950 OLED models. No, this year we should expect to see - and raise eyebrows to the $10,000 price tag attached to - what the company is calling its “most premium turntable ever”, the SP-10R. A new SL-1000R, meanwhile, adds a base and tonearm to the SP-10R’s architecture - while doubling the price, natch. 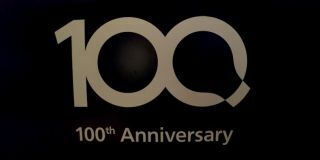 As opposed to throwing a party, Panasonic will show off a dedicated ‘100 Years’ exhibition on its CES showfloor this year, which we’re being treated to a sneak preview of very soon. The display will likely centre around a historic time capsule of the brand’s AV voyage. Because let’s be honest, 100 candles is probably too many even for a Las Vegas-made birthday cake.